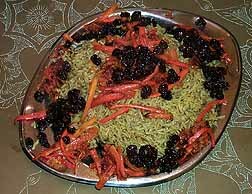 Pilaus, rice and meat dishes, are central to any Afghan dinner and I was very interested in trying one. I found several recipes for Qaubili Pilau but chose the original one below because it seemed rather simple. It was pretty good, a dish that certainly grows on you as you keep eating it. It is also a beautiful looking dish, and one that will likely impress your guests. The original recipe claims to be for 6-8 people. While this may be so if served as part of a Dastarkhan (an Afghan banquet), it will probably serve no more than 4 if served as a main or only dish. In my version I increased the amount of meat that it calls for - if you use beef or chicken, you probably will need to use less, but lamb is very fatty and not much remains when you trim it of all the outside fat. I also reduced the amount of oil it calls for, but it is still a very fattenning dish. I forewent the optional blanched almonds because I didn't feel like making them, but I think they would have added a nice, crunchy element to the dish. I changed a little the amount of spices required and added garam masala, which I saw as an ingredient in other variations of this recipe. In a heavy pot, fry the onions until golden brown. Cut the lamb into bite-size cubes and add to the onions. Add salt and spices. Add water. Mix well, cover and cook until the lamb is done. Meanwhile cut the carrots into toothpick-size pieces. Fry them on vegetable oil with sugar until tender. Remove from oil. Add raisins to the oil and fry until they swell up. Remove from the oil. Add almonds to the oil and brown. Remove and set aside. Once the lamb is done, remove from the water and set aside. Add rice to the remaining lamb stock. Add salt and water. Boil until the rice is done, about 20 minutes. Once the rice is done, remove from the pot and put it on a oven-save caserole. Place lamb on top of the rice, cover and cook on 300 degrees for about 20'. Serve by placing the lamb on a serving plate, covering it with the rice, and topping it with the carrots, raisins and almonds. Qaubili Pilau Heat 1/2 cup vegetable fat in a Dutch oven or pressure cooker, add 1 medium onion, diced, and fry until lightly browned. Add 1 lb. of beef or lamb, cut in 1 inch cubes, and brown. Add 2 cups water, 1 tsp. salt and 1 1/2 tsp. mixed spices (equal parts of cinnamon, cloves, cumin and cardamom, ground). Cover and simmer, or cook under pressure until the meat is tender. Remove the meat and set aside - save the juice for cooking the rice. Cut 2 carrots into toothpick size pieces. Heat 1/2 cup vegetable fat in a saucepan. Add 1 tbsp. sugar and the cut up carrots and simmer until tender. Remove carrots from fat, add 1 cup dark, seedless raisins, and cook until they swell up. (You may also brown a couple of tablespoons of blanched almonds.) Remove each and set aside. To cook the rice, boil the meat juice and add 2 cups long grain rice, 1 1/2 tsp. salt, and sufficient water to bring the liquid 2 inches above the rice. Add the oil in which the carrots were cooked and 1/8 tsp. saffron (optional) to the cooked rice. Put meat and rice in a large casserole, cover and set in a 300 degree oven for 20-30 minutes. Place meat in the center of a large platter. Mound the rice over the top and sprinkle with carrots, raisins, and almonds. Serves 6-8.